We got the latest inflation print from Japan overnight. 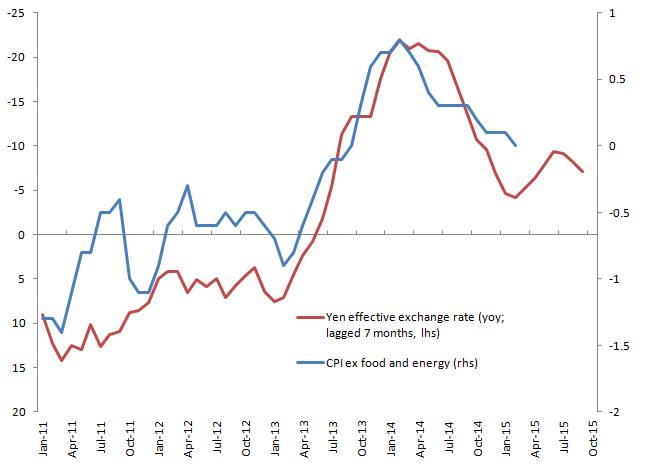 And once you strip out the effects of the VAT hike last year, CPI inflation less food (the version the BoJ target) has fallen to zero in February. Similarly, the ex-food and energy series has also fallen to zero, but somewhat less quickly. The stated aim of the BoJ, as Governor Kuroda has said many times, is to raise inflation to 2% in ‘around’ 2 years from when they started the massive QE programme back in April 2013. But as any central banker knows, it is foolhardy to give precise timing on these things, even if you are confident in your policy prescriptions and forecasts. And so it has proven, that as the initial boost to inflation from the lower Yen fell out of the yoy comparison, and oil prices slumped, that the likelihood of the BoJ reaching their target in the said timeframe has been lost. The response, not surprisingly, has been to be a bit fuzzier about the timetable and to say that they will look through the energy price effects on their target measure of CPI. 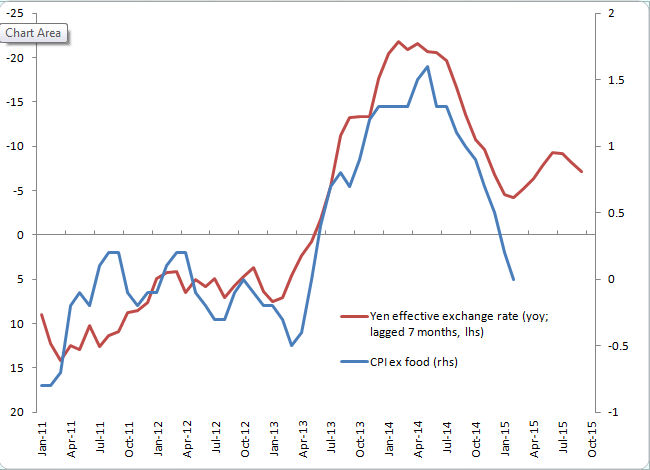 Unfortunately, as the ex-food, ex-energy version did not react as much to the depreciation in the Yen (simply because it doesn’t have energy, which is now heavily imported by Japan since they closed down the nuclear plants), it is also a long way from the 2% target.